I've helped thousands of people protect themselves and their families from the dangers of EMFs since 2009. And today's announcement is the biggest news I've shared over the past decade. 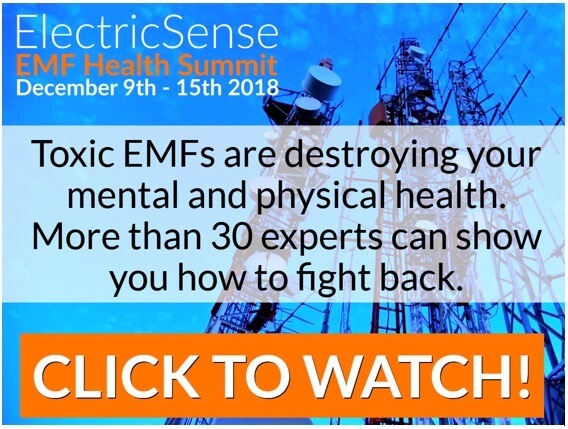 During the past year, I've connected with 34 world-class experts about EMFs, 5G, Wifi, and how to regain your health naturally. Each of them shares their best strategies to protect yourself from these digital toxins, which are causing chronic inflammation and a host of other conditions. They've all agreed to be a part of my FREE online event...which starts on December 9th. Register here today to guarantee you don't miss it! I always ask you to share my emails, well this time it's super important to share because with your help I really feel we can change something here. Please share with your loved one's, your friends and your neighbors! Live a naturally healthy life in our electromagnetic world! Also FYI, for other health related free online seminars, @KenAdachi1 (twitter) of "Educate-Yourself.org" has been tweeting for several months re all the OTHER seminars taking place this Fall/Winter (auto-immunity, cancer, Alzheimers, etc.) I can't keep up with them all. Check his twitter if interested.